The birth of Scouting had a head start in Sutton Coldfield. The experimental camp on Brownsea Island in Poole Harbour became of interest to all youngsters across the country. It was here at Brownsea that Baden-Powell wanted to carry out his ideas to help Edwardian boys become good citizens. Following the camp B-P wrote his famous book, Scouting for Boys which was originally published in in 1908 in six fortnightly parts. Boys enthusiastically formed Patrols and Troops and asked adults to be their Leaders. To avoid chaos B-P asked key people to set up Scouting in their own counties. 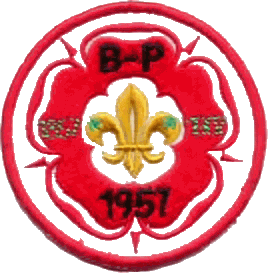 B-P wanted a system and organisation to allow Scouting to develop across the country. It took Birmingham County five years to set up the Districts, each with its own management structure. The first group to open was the First Sutton Coldfield and by 1985 we had thirty Groups across the Sutton District. By 1993 it was decided by Headquarters that the number of groups in our district was very large and, in some circumstances, larger than some counties. So the Sutton Coldfield district was then split in half (East and West) with equal numbers of groups in each new district, each with its own management structure. The Scout Association award-winning training scheme for volunteers means that adults get as much from Scouting as young people. The biggest event ever held within Sutton Coldfield was the 1957 World Scout Jamboree, held in Sutton Park in August 1957. The 9th World Scout Jamboree, also known as the Jubilee Jamboree, was held at Sutton Park, Royal Town of Sutton Coldfield, Warwickshire, England, for twelve days during August 1957. The opening was on 1st August, and the closing ceremony concluded on the 12th August. The Jamboree marked dual milestones as it was both the 50th anniversary of the Scouting movement since its inception at Brownsea Island and the 100th anniversary of the birth of Scouting’s founder Robert Baden-Powell. Held concurrently with the World Jamboree were the 2nd World Scout Indaba and the 6th World Rover Moot, as well as the third Girl Guide World Camp. All the events took place on adjacent sites within Sutton Park located in Sutton Coldfield. As well as the 33,000 participants from 85 countries, an additional 17,000 British Scouts were camping on other organised sites spread over a fifteen-mile radius from Sutton Park and attending the daily organised events at the main campsite, giving a total attendance of 50,000 Scouts in residence, with a further 7,000 being bused in from locations all over England for day-long visits that were spread over the 12 days of the Jamboree. The vast undertaking was under the leadership of Sir Robert Lockhart, Deputy Chief Scout, as the Camp Chief. He was assisted by Chief Executive Scout Commissioner Fred Hurl who was Deputy Camp Chief. The Jamboree’s Executive Commissioner was Kenneth H. Stevens, the permanent commissioner at Gilwell Park, Scouting’s permanent campsite near Chingford London, who oversaw the organisation of the many satellite camp sites. The Jamboree was formally declared opened on 1st August by Prince Philip, Duke of Edinburgh, accompanied by the British Prime Minister, Harold MacMillan. The Jamboree was closed on 12 August by the World Chief Guide, Olave, Lady Baden-Powell, who gave her speech alternately in both English and French. Lady Baden-Powell was accompanied by the Lord Mayor of Birmingham. The concurrent Jamboree-Indaba-Moot, known by most as JIM, was opened by Prince Henry, Duke of Gloucester. 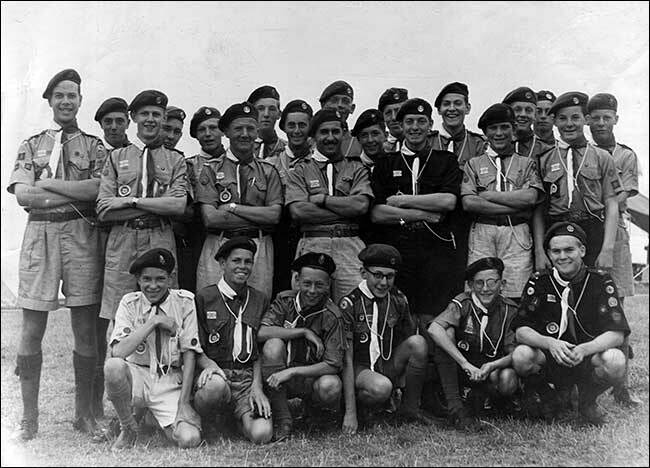 During this Jubilee Jamboree, Scout leader and radio ham Les Mitchell announced his idea of the Jamboree on the Air allowing Scouts worldwide who were unable to attend to experience the event over the radio and to hold annual radio “meets”. The 1957 event was the first Jamboree that had been held in England to have its own commemorative postage stamps produced by the General Post Office. In conjunction with the Jamboree, the Scouting Association promoted a week-long Gang Show at the Hippodrome Theatre in central Birmingham between 5th and 10th August, led by Ralph Reader and featuring the full 150 strong cast, from his London-based Gang Show. Buses were provided each evening to bus up to 500 campers into the city centre for the show. Daily rail excursion charter trains were laid on to transport the international Scouts on sight-seeing trips to various British cities, including Nottingham, Leicester, Swindon, Loughborough, London and Cardiff. The Jamboree event is commemorated by a short stone pillar in the centre of Sutton Park, between Streetly and Town gates, that still stands near the site of Lady Baden-Powell’s closing address. The weather during the 12 days ranged from an oppressive summer heat wave to two days of torrential rain that turned many pathways into quagmires. A one-off production had taken place in 1949 but, although it called itself a Gang Show, it was in fact a concert with members of different scout groups performing their own items. The first few shows were annual events taking place around Easter time at Bishop Walsh School. 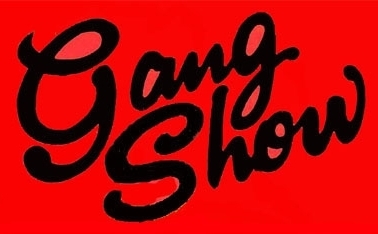 In 1972 the show was awarded the Gang Show Emblem. This acknowledged that the show was of a high enough standard to wear the coveted red scarf of the London Gang Show. We have been re-assessed on several occasions and still proudly wear the red scarf. John Styles, the London Gang Show pianist, carried out our original assessment. We were very proud when, the following year, John saw fit to return, this time accompanied by Ralph Reader himself. Considering the huge number of invitations Ralph used to receive this was indeed a great accolade for our show. It was felt that an annual show put too many demands on the production team who were, and still are, active scouters. The show became bi-annual and in 1979 moved to Bishop Vesey’s Grammar School where we have been made very welcome ever since. We are now in our Fifty-second year.